Home > Food Facts > Oils > Is Avocado Oil Healthy for Cooking? Is Avocado Oil Healthy for Cooking? Simply put, avocado oil is the oil obtained by pressing an avocado fruit. The avocado, also called the “alligator pear,” is a great source of important vitamins and minerals and offers many health benefits. It’s no wonder that many are curious about the benefits of using avocado oil for cooking. Avocado oil is a unique plant oil; unlike most plant oils that derive from the seed of the plant, avocado oil is extracted from the flesh of the avocado. A majority of fruits also contain little or no fat, but the avocado has a high amount of healthy, beneficial fats. At one time, the most common use of avocado oil was for cosmetics due to its rapid absorption by the skin, but lately, it has become a popular oil for cooking purposes. The best part is that avocado has an unusually high smoke point of 500 degrees F, which means you don’t have to worry about the oil breaking down and producing harmful free radicals, even at a high temperature. You can cook a plethora of tasty dishes in it. Avocado oil is increasingly being used to prepare healthy dishes because of its mild flavor as well. There are several avocado oil health benefits, nutrition facts, and recipes to explore. Let’s get started! Although many people have described the taste of avocado oil as slightly buttery or nutty, it’s considered to have a neutral taste. Avocado oil isn’t quite as flavorful as the avocado fruit. Avocado oil is often used for salad dressing and in various recipes for dips, marinades, and sauces. You can use the oil to sauté, grill, or stir-fry all types of foods. You can coat pans in avocado oil to prevent food from sticking to them and also to season cast-iron cookware. Avocado oil is often compared to olive oil because both have a good amount of healthy fats, but avocado oil scores higher when cooking over high heat due to its smoke point. You can really reap a lot of benefits from using avocado oil, but only if used in moderation. Avocado oil does not contain any significant amounts of carbohydrates, vitamins, minerals, proteins, or dietary fibers. It does contain some fats, namely saturated fat, polyunsaturated fat, and monounsaturated fat. Saturated Fat – Saturated fats are considered less healthy fats as they are believed to contribute toward heart disease. According to the American Heart Association, you should choose oils that contain less than four grams of saturated fat per tablespoon. Avocado oil gets a “thumbs up” because it contains just two grams of saturated fats per tablespoon. Polyunsaturated Fat – Polyunsaturated fatty acids, also called PUFAs, are known to have a positive effect on the cardiovascular system, and avocado oil has two grams of heart-healthy, polyunsaturated fats per tablespoon. Monounsaturated Fat – Monounsaturated fats, also called MUFAs, are believed to increase the levels of high-density lipoprotein (HDL) cholesterol, or “good” cholesterol, in your body. Avocado oil has around 10 grams of monounsaturated fats per tablespoon, so it is definitely a healthy oil compared to other oils which have a higher amount of saturated fats and trans fats. Refined avocado oil has a high smoke point of 500 degrees F, but the virgin oil’s smoke point is much lower at 350 to 375 degrees F. This means that you can safely sauté, sear, bake, and barbecue at high temperatures when using refined oil, but not when you are using virgin oil. Even though virgin oil is very healthy and has a beautiful color, refined avocado oil will give you more leeway in your cooking. Only refined avocado oil will reach a 500 degree F smoke point and give you more options for cooking dishes at high temperatures. Is Avocado Oil Diet Friendly? 1. Avocado Oil in Keto Diet – Avocado oil has a high amount of monounsaturated fats and a good amount of antioxidants. Again, where it scores over healthy oils is its high smoke point, which makes it a healthy and ideal Keto cooking oil for any application. Another advantage of avocado oil is that it is liquid at room temperature, which makes it perfect for drizzling over salads and veggies. The levels of monounsaturated fats are high in avocado oil, and they are good for the heart. So, avocado oil is without doubt Paleo. 3. Avocado Oil in Vegan Diet – Avocado oil’s high smoke point also makes it perfect for a vegan diet. It allows you to prepare vegetable dishes, salad dressings, and bake without animal products as well. The only sore point is that avocado oil is expensive, but you get so much more in return in the form of good health, so it’s worth the few extra dollars that you have to pay. Reduction of Symptoms of Arthritis – Arthritis is a painful disease that is characterized by inflammation of the joints. Osteoarthritis, the breakdown of cartilage in joints, is the most common form of arthritis. According to a 2015 study published in Cartilage, extracts from avocado and soybean oil called avocado/soybean unsaponifiables can reduce the pain and stiffness found in patients suffering from osteoarthritis. It is reportedly extra beneficial for hip and knee osteoarthritis patients. Improvement in Eye Health – Avocado oil contains lutein, a carotenoid that is naturally present in your eyes. Lutein works as an antioxidant that can help protect your eye health. Consuming lots of lutein may lower your risk of developing cataracts and macular degeneration. Your body does not produce lutein, so you can get it by including avocado oil in your diet. Increase in Good Cholesterol – Animal studies such as a 2003 study published in the Journal of the American College of Nutrition have reported benefits for heart health with the usage of avocado oil. Researchers compared the effects of avocado oil with corn, olive, and coconut oil on rabbits and found that avocado oil has beneficial effects on blood cholesterol levels. It was also found to be very effective in increasing good HDL cholesterol. Other rat studies, published in the Journal of Ethnopharmacology (2005) and Disease Markers (2014), showed that avocado oil might decrease LDL cholesterol and blood triglyceride levels and could also lower blood pressure. Prevention of Inflammation – Avocado oil contains antioxidants that may help in healing the dry, flaky, and inflamed skin that often results from psoriasis and eczema. If you have a skin condition or disease, it’s advisable to perform a skin patch test first, to find out if the avocado oil worsens or triggers your symptoms. Prevention of Gum Disease – There is evidence that the combination of avocado oil and soybean oil extracts may help prevent gum disease. Gum, or periodontal, disease is an inflammatory disease with symptoms that include swollen, red, and bleeding gums; the deterioration of bone and tissue near teeth; and bad breath. It may even lead to tooth loss. In a 2006 study published in the Journal of Periodontology, in bone cells and periodontal tissue, avocado/soybean unsaponifiables may block a protein called IL1B. IL1B is a protein that is responsible for the breakdown of tissue and bone loss in gum disease, and it also promotes inflammation. 1. Salad dressing: You can use it instead of olive oil in your favorite dressing. 2. Mayo: You can use it in place of canola oil when you make mayonnaise at home. 3. Dip: Combine it with sea salt or red pepper flakes in a bowl to make a simple bread dip. 4. Smoothies: You can add a tablespoon of avocado oil to any smoothie to give it a kick. 5. Hummus: Drizzle it over hummus and serve with fresh, raw vegetables. 6. Soup: You can add a swirl over hot or cold soups. 7. Fish: Sprinkle the oil over fish before baking or roasting it. 8. Roasted veggies: Coat a pound of cubed root vegetables in a tablespoon or two of it. Then roast for 40 minutes at 400 degrees F.
9. Fruit: Drizzle some cantaloupe slices with avocado oil and top with a few flakes of sea salt. Put the egg yolks into your food processor. Add the lemon juice and water. Then sprinkle some salt on top. After closing the food processor, pulse it once or twice to mix the contents. Pour the avocado oil into the feeder tube of the processor so that it drips over the egg yolks in a thin and smooth stream. Do this until the mayonnaise gets thick, and all the oil is taken in by the egg yolks. This should take around two or three minutes. Scoop the mayonnaise into a jar with a tight-fitting lid. You can store it in your refrigerator for up to seven days. Serve two tablespoons at a time. Sprinkle sugar and salt on the shrimp. Mix cumin, chili powder, oregano, and coriander very thoroughly. Coat the shrimp in the spice mixture (lightly). Over medium to high heat, heat a large, nonstick frying pan. Add one teaspoon of oil and half the shrimp; sauté for about four minutes. Repeat the process with one teaspoon of oil and the leftover shrimp. Transfer the shrimp onto a platter and drizzle with the remaining oil. Serve with lime wedges. Avocado oil is the oil derived from pressing avocados and studies suggest it is very beneficial for health. Though it started out as being primarily used for cosmetics, it has slowly become a popular cooking oil. Since it has a high smoke point, it can be used to grill, stir-fry, broil, and sauté dishes at high temperatures. For the same reason, it is better to use refined avocado oil than virgin avocado oil. According to research, avocado oil offers health benefits such as reducing symptoms of arthritis, improving eye health, increasing good cholesterol, preventing inflammation, and preventing gum disease. It has low amounts of saturated fat and trans fat, which makes it a healthier alternative to other cooking oils. Avocado oil sits well with many diets, including Keto, Paleo, and vegan ones. You can make a variety of dishes with avocado oil like spicy shrimp with avocado oil and also avocado oil mayonnaise. Avocado oil is a little expensive, but hey, nothing matters more than your good health. So go ahead and cook with avocado oil, even if it means spending a little more of your hard-earned money! https://paleoflourish.com/is-avocado-oil-paleo, last accessed November 7, 2018. Wells, K., “Avocado Oil Benefits: Healthier than Coconut Oil?,” Wellness Mama, July 27, 2018; https://wellnessmama.com/123677/avocado-oil-benefits/, last accessed November 7, 2018.
https://www.verywellfit.com/avocado-oil-nutrition-facts-and-health-benefits-4164412, last accessed November 7, 2018.
https://vegetarian.lovetoknow.com/vegetarian-eating/benefits-avocado-oil, last accessed November 7, 2018.
https://nutritiondata.self.com/facts/fats-and-oils/620/2 last accessed November 7, 2018. My Heart Beets, “Healthy Cooking Fat: Avocado Oil,” my heart beets, February 24, 2014; https://myheartbeets.com/healthy-cooking-fat-avocado-oil/, last accessed November 7, 2018. Alexander, A., “Avocado Oil as a High Heat Cooking Oil,” CHOSEN FOODS, September 24, 2014; https://chosenfoods.com/blogs/central/avocado-oil-as-a-high-heat-cooking-oil, last accessed November 7, 2018. Janine, “A GUIDE TO COOKING OILS ON THE KETO DIET,” KETODOMAIN, January 8, 2018; https://www.ketodomain.com/keto-food-info/guide-cooking-oils/, last accessed November 7, 2018. Caruthers, D.S., “5 HEALTHIEST COOKING OILS FOR VEGAN DIETS,” VegNews, August 2017; https://vegnews.com/2017/8/5-healthiest-cooking-oils-for-vegan-diets, last accessed November 7, 2018. Palsdottir, H., “9 Evidence-Based Health Benefits of Avocado Oil,” health line, April 6, 2016; https://www.healthline.com/nutrition/9-avocado-oil-benefits, last accessed November 7, 2018. “Management of Osteoarthritis with Avocado/Soybean Unsaponifiables,” NCBI, January 2015; https://www.ncbi.nlm.nih.gov/pubmed/25621100/, last accessed November 7, 2018.
https://www.ecowatch.com/9-health-benefits-to-adding-avocado-oil-to-your-diet-1891081723.html, last accessed November 7, 2018. “Cholesterol vehicle in experimental atherosclerosis 24: avocado oil,” NCBI, February 2003; https://www.ncbi.nlm.nih.gov/pubmed/12569114/, last accessed November 7, 2018. “Effect of an avocado oil-rich diet over an angiotensin II-induced blood pressure response,” NCBI, April 2005; https://www.ncbi.nlm.nih.gov/pubmed/15814269, last accessed November 7, 2018. 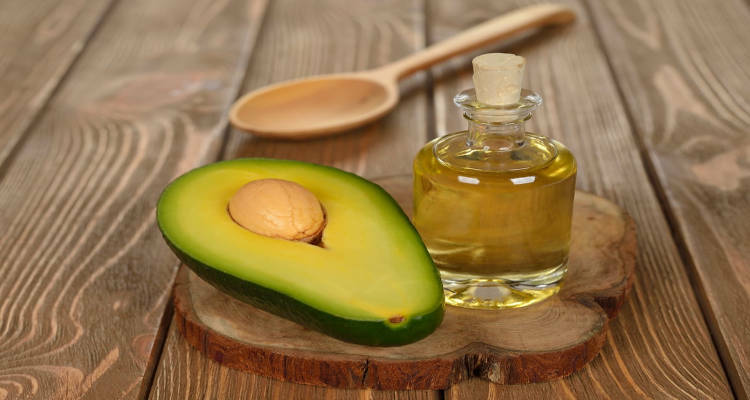 Barhum, L., “Eight benefits of avocado oil for the skin,” MedicalNewsToday, April 19, 2018; https://www.medicalnewstoday.com/articles/321543.php, last accessed November 7, 2018.
https://www.ncbi.nlm.nih.gov/pubmed/16805677, last accessed November 7, 2018.
https://www.today.com/food/avocado-oil-new-coconut-oil-how-do-you-use-it-t65581, last accessed November 7, 2018.
https://nourishedkitchen.com/avocado-oil-mayonnaise/, last accessed November 7, 2018.
https://www.geniuskitchen.com/recipe/spiced-shrimp-with-avocado-oil-91632#activity-feed, last accessed November 7, 2018.